A classic New England saltbox, renovated and expanded to become a family retreat, sits nestled in a forest outside a ski mountain in Wilmington, Vermont. An addition to the back of the house, featuring wall-to-wall windows and French doors that open to a heated patio, was dubbed “the snow globe” by the family for its enchanted, cozy feel when the flakes fall. A chic console doubles as a mini cocktail bar, perfect for entertaining. Accents like a rustic cowhide and this Lillian August ottoman/coffee table, made from a kilim rug, add warmth and mountain-house flair. A compact kitchen boasts sleek grays and floor-to-ceiling handmade Spanish tile that plays off the herringbone pattern of the porcelain hardwood flooring. The home’s name, “Out of Bounds,” is laser-cut into the mudroom floor in a welcoming gesture to family and guests. An industrial cabinet showcasing ski sweaters meets both form and function needs of a modern ski house. Bright yellow window coverings and throw blankets in the kids’ bedroom add subtle energy to the woodsy palette. The master bedroom, with its rustic wood walls and arrow decor, muted bedding, and modern Lucite nightstands, is a mélange of styles that work in perfect harmony. They call it the snow globe: the room where you can while away hours with a cup of tea and a blanket, surrounded by wall-to-wall, floor-to-ceiling windows and with the fireplace aglow, watching the snow drift down around you. 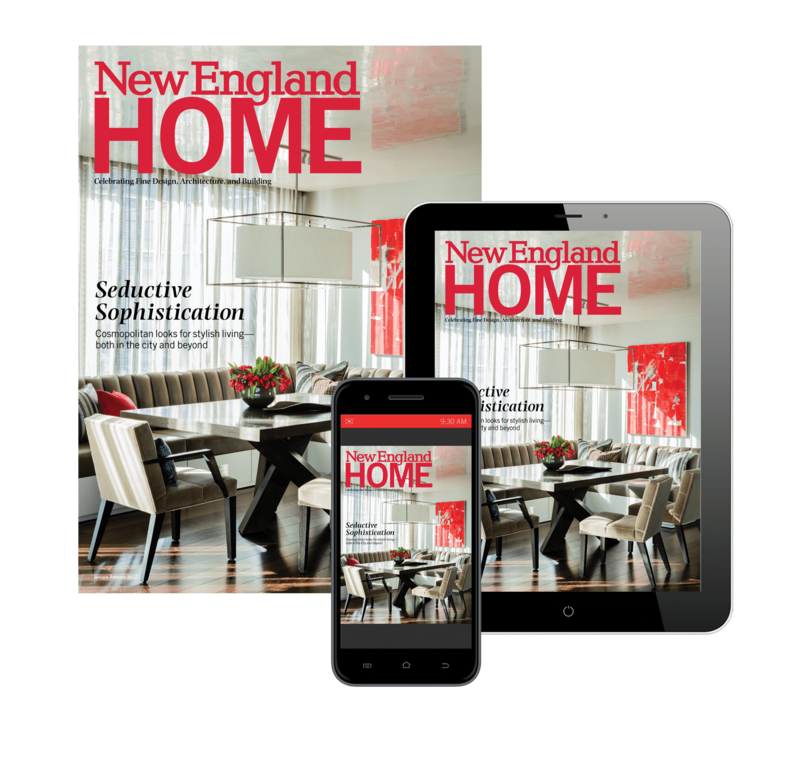 It’s exactly the feeling interior designer Lisa Ehrlich was going for when she sketched out plans for the overhaul of the classic New England saltbox she and her husband purchased in Wilmington, Vermont. “There’s something so magical about sitting in that space and watching it snow,” Ehrlich says. “The house is nestled on the property in a way that, when you look out a window, you don’t see another house. It feels really special, like a retreat.” And that’s essentially how the Ehrlich family spends every weekend in the winter (not to mention key leaf-peeping weekends in the fall and at least a full week in the summer). They closed on a Friday morning, and the construction crew arrived that afternoon. Ehrlich had already roughed out her vision on a scrap of paper and handed it off to design-build firm Vermont Barns to bring to life. That first weekend, they gutted the entire kitchen and the bathrooms and ripped up all the carpeting. Eventually, they blew out a kitchen wall and a great room wall to build the snow-globe addition, complete with a deck warmed by industrial-strength heat lamps—perfect for sipping a cup of cocoa in the mountain air when the temps dip into the single digits. They added a lower garage to the back of the house: a forty-foot-long rectangle they dubbed “the sports garage,” which houses snowmobiles, mountain bikes, and “all kinds of toys,” Ehrlich says. Another garage addition, featuring a loft designed to be a party space and a sizable area for kitchen storage and setup, further adds to the home’s entertainment appeal. All told, they doubled the home’s size to 3,500 square feet. Still, Ehrlich notes, she worked hard to preserve the home’s historic integrity. She kept the narrow farmhouse stairs to maintain the rustic mountain-house appeal, and the century-old barn wood walls continue to be a show-stopper. The original cedar exterior siding was replaced with reclaimed wood, in keeping with the mountain-cabin aesthetic. Blending that rustic cabin feel with a sleek, updated vibe is a testament to Ehrlich’s nuanced vision—and proof that a mountain house can have antler chandeliers without feeling kitschy and herringbone porcelain flooring without looking too modern. A palette of warm woods and cool grays is punctuated with bright mustard yellow in the window treatments in the kids’ room and the occasional stool or pillow. Ehrlich’s design hinges on a few key philosophies. First, prioritizing both form and functionality. Pieces were selected for their visual appeal and their usefulness in a family setting. Antler hooks on the backs of the bathroom doors are a lifesaver with mountain-house flair for a mom who cringes at wet towels on the floor. A vaguely industrial armoire in the kids’ bedroom is “both a neat storage solution and a decorative way to showcase ski sweaters,” Ehrlich says. Third, the belief that beautiful spaces can integrate both high-end and off-the-shelf furnishings and accessories. Rooms are peppered with anchor furniture from Lillian August, and accented with, say, a lighting fixture from Lowe’s (in the breakfast nook) or vintage oversized light-up wall initials from HomeGoods (in the kids’ bedroom.). The overall effect? Well-edited, high-quality, and approachable. One of her favorite custom touches? The Ehrlichs named the house “Out of Bounds” due to its proximity to a local ski mountain—not quite ski-in-ski-out, but just beyond the property lines—and as a play on how they view their time at their Vermont hideaway. They immortalized the moniker around the house: on a sign commissioned from the company that makes the ski mountain’s actual trail signs; on a custom-made shower curtain; and laser-cut on the black-and-white tile floor of the mudroom, inviting their guests into a little bit of their family story. “Early on, my husband and I said, ‘We want to have family memories when our children are grown.’ When we’re there, we’re a family unit; we don’t let other things distract us.” Indeed, the memories are piling up every weekend the Ehrlichs spend out of bounds in their very own snow globe retreat.